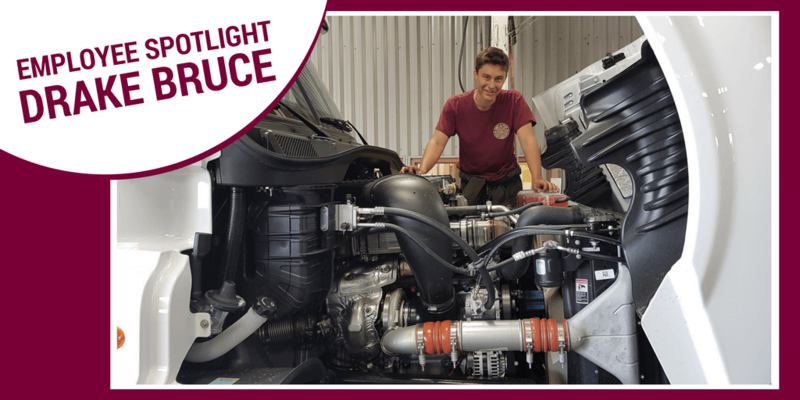 Drake Bruce, senior at Cobequid Educational Centre (CEC) in Truro had an interest in heavy-duty truck mechanics and decided to take advantage of his high school’s work placement program. In June 2017, Drake started his 4-week work placement at Nova’s Truro location where he was able to job shadow licensed Red Seal technicians to get a feel for the industry and work place culture. After the first work placement ended, Drake joined the Test Drive program, which is a 6-week program offered by the Automotive Sector Council. This program offers participants the opportunity to test drive the trade by working with Red Seal Technicians to decide if this field is right for them or before committing to schooling. It also allows students the chance to learn in the environment while out of school, so they can gain insights on what the day-to-day would look like as a technician. After completing both programs, Truro Service Manager, Rob Eichenberg was impressed by Drake’s abilities and work ethics. Rob decided to offer Drake a part-time job doing some maintenance work in the shop while finishing his last year of school. After graduating high school, Drake will be joining the Apprenticeship program at the Nova Scotia Community College (NSCC) for the fall 2018 to continue studies as a Heavy-Duty Mechanic. Drake is one of 2 students to work with Nova through the Test Drive program. Last summer Ian MacFarlene participated in the program and has since been hire on as a Trailer Technician in Truro. What would your advice be to others thinking about taking the trade or program?